Today is Reformation Sunday, a day that calls us to focus on the whole idea of righteousness and what it means to be righteous, or just. Before you go to sleep at the mention of a couple of words used a lot in the Church and hardly at all in the rest of the world, please know that being righteous is the requirement for entering the Kingdom of God. Righteousness is the essential quality we must possess in order to claim an eternal place in heaven and avoid eternal consignment to hell. Righteousness is the essential quality we must possess in order to have a life with God today, in this world. A young German, Roman Catholic monk, priest, and professor Martin Luther, who lived in the sixteenth century, knew how essential being righteous is for anyone to have a relationship with God, either now or in eternity. 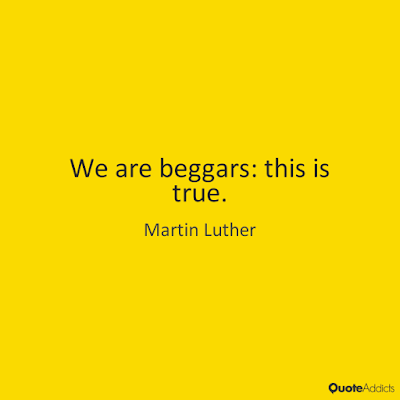 Luther likely would have read words like those of Jesus in Matthew 5:20--”...unless your righteousness surpasses that of the Pharisees and the teachers of the law, you will certainly not enter the kingdom of heaven”--and think, “I need to get busy. I need to do more good things. I need to remember more of my sins and repent for them. Otherwise God will damn me for eternity.” To someone as neurotic and driven as Luther, these were daunting, terrifying thoughts. That’s because to be righteous means to be in sync with the Law of God, the will of God for human beings. To be righteous is to walk in the ways of God. Luther knew how, in his heart of hearts, out of step with God he was and thought that to become righteous, he had to work at it. 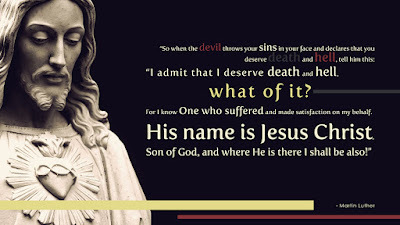 The problem was that no matter how much he repented or how many good things he did, he would always remember one more unrepented sin or commit a new one after confessing the old ones or he would fail to do enough good or fail to do good for the right reasons. Luther drove his Father-Confessor, Johann Staupitz, crazy. Luther would visit him multiple times a day to confess some new sin. Finally, von Staupitz told Luther, "Stop coming to me with your puppy sins!" Luther felt that he could never attain the title of righteous. 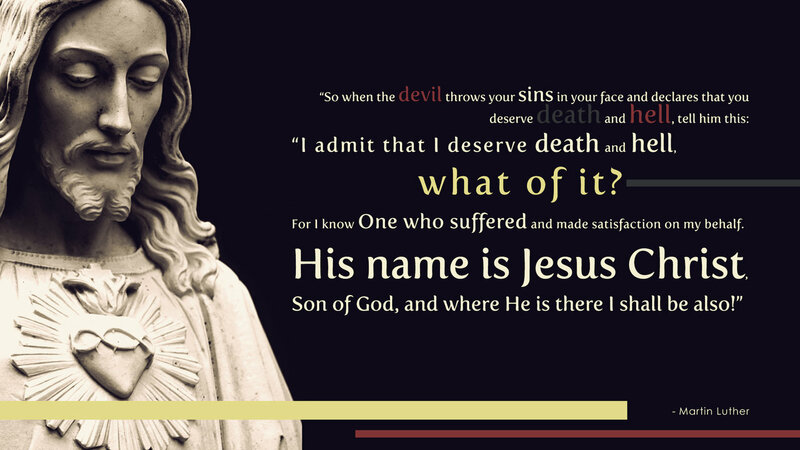 He felt that he was damned to hell and there was nothing that he could do about it. Here's the deal: According to the Bible, Luther was right. Luther couldn’t make himself righteous. Neither can you or I. When we consider the sinful things we do or think or fantasize, we’re bound to confess with King Solomon, who writes in Ecclesiastes 7:20: “...there is no one on earth who is righteous, no one who does what is right and never sins.” No one. Luther looked at how far he fell short of the moral standards of righteousness embodied in the Ten Commandments and realized that he would never measure up. Life with God was out of his reach. He later confessed that, there in the monastery, working at being righteous for God and realizing that he never could make himself righteous, he hated God. He saw God as a monster, demanding of him (and of all of us) what none of us can do. And in hating God, Luther's guilt and his sense that he would inevitably be swallowed up by the fires of hell, only increased. Luther's superiors were driven to distraction by his questioning, wandering, brilliant mind and by his neurosis. So, they tried to keep him busy. By his mid-thirties, he was both a parish priest and the administrator of fourteen monasteries. But still his restless, self-loathing seeking after God and righteousness continued. At the direction of his superiors, Luther became a scholar of the Bible, so that he could teach at the new Wittenberg University. "I can't do that," Luther told them. "The work will kill me." "That's all right," they responded. "God can use trained scholars of the Bible in heaven." It’s good and loving for God to give us His commandments. God's Law marks out the boundaries of a life not only more pleasing to God, but also that marks out the boundaries within which there’s life with God and beyond which there’s death. But because we can never keep God’s Law perfectly, His Law can never make us righteous. At the most, God’s Law is a mirror that shows us the awful truth with which Luther wrestled about himself, which is true of us as well, that we aren’t righteous and can’t make ourselves righteous. The Law is very bad news for anyone who thinks that being nice or doing good are enough to give us an in with God. To understand the message of these magnificent verses from our lesson, let’s look at several key words as they appear in the Greek language in which the apostle Paul wrote the letter to first century Roman Christians. The first word is δικαιοσύνη, which we translate as righteousness. The other word, appearing in verse 26, is justifies; in the Greek in which the apostle Paul wrote the verse, that word is δικαιοῦντα. When you hear those two words--δικαιοσύνη, δικαιοῦντα--you can tell that they’re related. And being able to tell this helps us to understand what it means to be justified or counted just, righteous. It means that despite our sin, despite our inability to obey God’s Law or to make ourselves righteous, God gives Christ’s righteousness to those who entrust their lives to Christ, surrender to Christ, believe in Him as their only God, Savior, or hope. We can’t attain the righteousness necessary to enter God’s Kingdom. We can't work to become righteous, but God "righteous-fies" all who entrust their lives to Christ. We can't as I said earlier, climb or claw our way to righteousness; but the great thing is that we can take an elevator. That elevator is Jesus Christ! Jesus has perfectly obeyed God’s Law for us and then shares the perfection of His obedience with those who believe in Him to make us righteous. And this isn't a declared righteousness, what the theologians call forensic righteousness. God doesn't say, "You're a jerk, but I'm going to call you righteous." No, as we repent and believe in Christ, the power of God makes it righteous, changing the ways we think, live, say, and look at things. And, as we live in daily repentance and renewal, God imparts His righteousness to deeper and deeper levels in our lives. This is a hard concept for many people to grasp. "What do you mean? There's nothing I have to do to be acceptable to God? Nothing I need to do to turn my life around?" I'll never forget what happened during the reception after our son Philip and his wife Amy were married. It was held outdoors and people were sitting around bonfires. As I was getting ready to leave, I found Philip talking with a number of his college and seminary friends. Phil was nicknamed The Lutheran. At the moment I approached him, The Lutheran was explaining to his friends that there was nothing they could to make themselves righteous or more righteous; all they could do was let Jesus, by simple faith and trust in Him, cover us with His righteousness. They were skeptical; it seemed too easy. Phil saw me and said, "Dad, tell them!" I've always felt that being made righteous by Christ and being made holy (what the Bible calls being sanctified) by Christ is like gathering around a fire on a chilly night. There's nothing you need do to have your heart warmed into life by Christ, the Burning Center of the universe. We simply bask in His light and warmth and He makes us new. 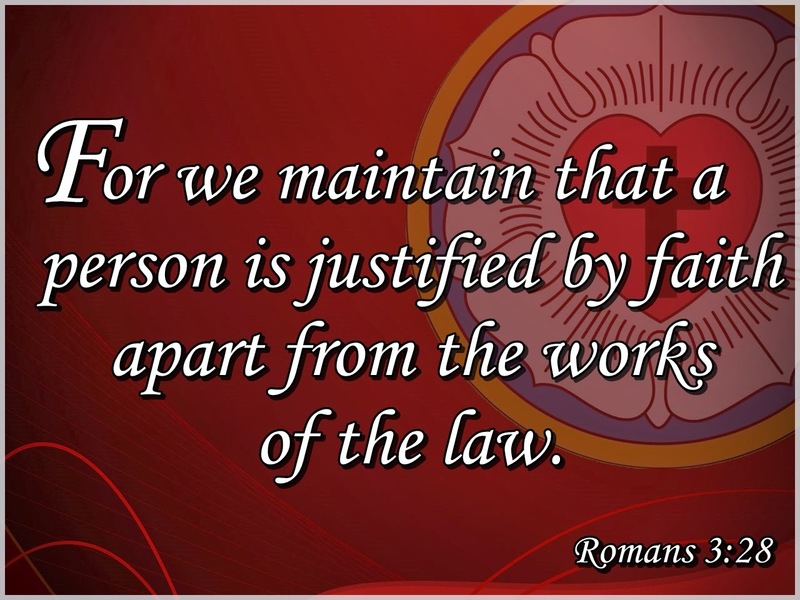 Martin Luther said that when he realized that we can only be and are justified--made righteous--by faith in Christ through the charitable grace of God, it was as if the doors of heaven opened to Him. And whenever we trust in Christ rather than ourselves, our efforts, our goodness, or our parents’ faith, heaven opens to us as well. Many of the self-identified Christians who get play in the media are people who seem to make a point of telling others how good they are, how wholesome they are, and what good values they have, while others are evil, devoid of values. They form organizations in which they claim to be part of God's "moral majority." These phonies are braggarts. If people brag about their own goodness or imply that they’ve attained righteousness by being wonderful people, they’re not Christians. Or, at least, they’re Christians who need to repent for their sin and surrender their egos to Christ. Rather than claiming to be members of a "moral majority," authentic Christians confess that they are actually part of the immoral majority who are saved by the grace of God given in Jesus Christ, not by their goodness. When Christians do brag, it’s not about their goodness. As Christians, we don’t brag about how wonderful we are. We know better. Our daily gaze on the face of God and into the mirror of God’s Law tell us that. Instead, we brag about how wonderful God is! 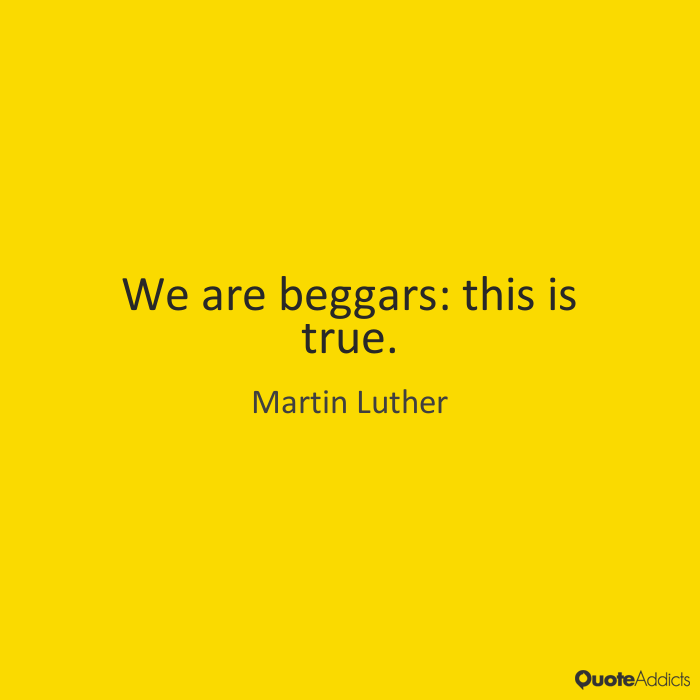 We’re not braggarts, we’re beggars, completely, utterly, totally dependent on the crucified and risen Jesus to justify us, to make us righteous, fit for life with God. But we live with the joy of knowing that even when the devil, the world, and our sinful selves are forced to agree with the Law that, in our own power, we aren’t and never can be righteous, in the power of God, through the spent blood of Jesus on the cross and our faith in Him, we are justified, we are right with God, we are righteous! We’ve been set free from sin and death and condemnation. And set free, no longer under the thumb of the Law’s condemnation, we can focus on truly living as disciples: following Christ, drawing on the Holy Spirit’s power to love God as He has loved us and to love others as Christ has loved us. In Christ, we are justified, we are righteous. That’s worth celebrating not just on the October Sunday closest to October 31, but every single day.